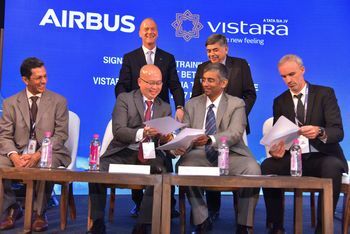 New Delhi: Vistara, India’s finest full-service carrier and a joint-venture of Tata Sons and Singapore Airlines, today signed a five-year agreement with Airbus Group India to provide training services to Vistara pilots for the A320 type aircraft. The two companies inked the agreement at the launch of Airbus India Training Centre (AITC) in New Delhi, which brings state-of-the-art technology to India for the training of flight crew. The AITC is equipped with the latest software that accurately simulates the aircraft handling characteristics and system responses, ensuring Vistara pilots are well trained and become more proficient with global standards. Through this partnership Vistara pilots will gain significantly from Airbus’ world-class training methodologies and systems. “We are honoured to have Vistara as the first customer for the Airbus India Training Centre. We will start training their pilots when the centre becomes operational end-2018. Our success is tied to the success of our customers and one way we contribute to that is by offering them our services like flight training,” said Dr Srinivasan Dwarakanath, president, commercial aircraft, Airbus in India. In a little over 26 months of operations in the Indian domestic skies, Vistara has flown over four million customers already. The airline has expanded its network to 19 destinations across the country with over 500 weekly flights and 13 aircraft, connecting India with multiple international destinations via its growing number of interline partners.